This week in Quebec City, FBI agents gathered for an annual conference hosted by the non-profit FBI National Academy Associates, a group with over 20,000 members drawn from a cross-section of law enforcement agencies around the world. One of the conference’s keynote presentations focused on "radical left wing gangs in America." The topic of right-wing terror was not on the agenda, with keynote speaker Dale Yeager denying its existence in an interview with VICE News. Quebec City is an ironic place to be holding such a conference. Just last year, a racist gunman walked into a local mosque and killed six people during prayer. In his interrogation, the shooter said that he was worried about Muslims immigrating to Canada. Right-wing violence is indeed ascendant, and has a significantly higher body count in the United States and Canada than any other form of politically motivated violence. The city is a hotbed of far-right organizing. La Meute, arguably Quebec's largest Islamophobic and anti-migrant formation, is highly active in the city. Atalante, an openly fascist skinhead crew whose membership includes individuals convicted of racist knife attacks, is based almost exclusively there. Racist, nativist "radios poubelles" (trash talk radio) dominate the airwaves. Right-wing violence is indeed ascendant, and has a significantly higher body count in the United States and Canada than any other form of politically motivated violence. The historical relationship between the street-level far right and state security forces helps to make sense of the conference. While that history is littered with conflict and contradiction, it is also a history of collaboration. Today, the head of security for La Meute — Jacques Gagné — is a retired 31-year veteran of police forces in the Quebec City region. La Meute has made a concerted effort to appear friendly to police. Their rally in Quebec City last August saw the leadership distributing protest signs with messages of support for the RCMP. Alexandre Popovic is a writer and anti-repression organizer. Ahead of La Meute's July 1 demonstration in Montreal, he spoke at a meeting of the municipal public security commission. "Many of us have reasons to believe that the (Montreal police are) colluding with far-right groups," he told the commission. These remarks triggered an internal "verification" by the Montreal police that would check whether any agents have affinities for far-right organizations. The results of this process have not been made public, and Popovic doubts that the SPVM will be transparent about them. It wouldn't be the first time that individual cops were found to be active participants in the far right. Back in 1994, Toronto police officer Brad Coulbeck was revealed to be a member of the Heritage Front, a large and violent neo-Nazi skinhead organization that peaked in the early to mid-1990s. The organization was openly and explicitly white nationalist, and its members were implicated in a series of beatings and murders of people of colour in Toronto. 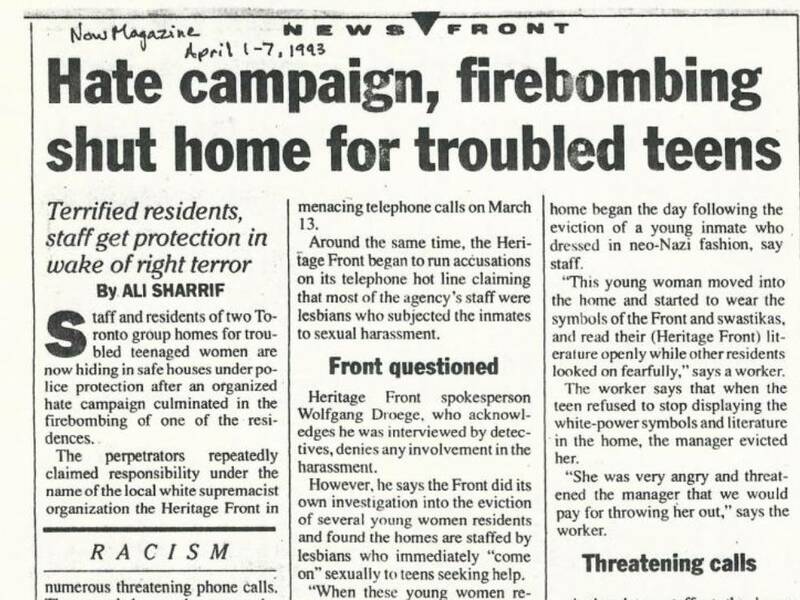 1993 NOW Magazine article detailing firebombing by the Heritage Front. The Heritage Front was supported in other ways by the Toronto police. The local hate crimes division provided Heritage Front leadership with photographs of anti-racist activists following a complaint by the Front's leadership that attacks against them were "anti-white hate crimes." The connection to the state security forces ran deeper than individual cops and local police. One of the group's founders, Grant Bristow, was a paid informant for the Canadian Security Intelligence Service from the very beginning. CSIS is Canada's domestic spy agency. Elisa Hategan was recruited as a member of the Heritage Front in 1991, when she was 16 years old. She eventually left the organization with the help of anti-racist activists, and provided information to the Ontario Provincial Police that would help bring the organization down. "Today we know that the source of that money was CSIS — in other words, Canadian taxpayers." In the two years she spent in the organization, she spoke at rallies and had a direct line to the group's leadership. In an interview, she described Bristow as one of the most important leaders of the group behind the scenes. In his role as a paid CSIS informant, Bristow funded the group's hotline — the main recruiting tool of the Heritage Front. He acted as the group's money manager and made personal donations to the legal funds for Heritage Front members who had been charged with crimes. "Grant Bristow helped the Heritage Front with donations, he was someone who always had money," Popovic said. "Today we know that the source of that money was CSIS — in other words, Canadian taxpayers." Bristow had no other source of income, Hategan said. She once called the phone number of the private investigation firm where Bristow claimed to work, only to find that no one at the company had ever heard of him. "I think CSIS was basically bankrolling the whole thing," she said. Bristow's role extended beyond finance. Hategan describes him as the driving force behind a protracted campaign of targeted harassment against Toronto's anti-racist activists. The paid CSIS informant was the head of the Heritage Front's "intelligence division" and trained members on how to harass the group's enemies. This involved finding phone numbers and addresses, and launching barrages of threats until the activists provided the names of their comrades. Bristow was also instrumental in bringing Tom Metzger — leader of the violent U.S. skinhead organization White Aryan Resistance — into Canada for a conference and direct action sponsored by the Heritage Front. He paid half the cost of Metzger's plane tickets. CSIS informed other departments that Metzger — who had an extensive criminal record — would be coming to the country but provided no specific details. The American white nationalist entered the country without issue and was arrested before the Heritage Front's direct action occurred. It was a media coup for CSIS, who framed the arrest as a tactical victory despite having engineered the entire situation. CSIS protected Bristow from various criminal charges, including weapons charges stemming from an arrest by Toronto police. Bristow was arrested alongside an American white supremacist with illegal firearms. After CSIS intervened, police unceremoniously failed to press charges. No charges were ever filed against Heritage Front members based on CSIS intelligence provided by Bristow. When Hategan began to inform on the group's activities, CSIS planned a campaign to discredit her in order to protect their source. Bristow was eventually provided full witness protection, including a salary package, while Hategan was denied any protection and forced to go on the run to avoid retaliation by white nationalists. Codenamed Operation Governor, the CSIS–Heritage Front collusion is perhaps the most striking Canadian example of systemic collaboration between state security forces and right-wing extremists. It mirrors what can be seen in the United States, where agencies including the FBI have a long history of working with white supremacists. In the 1960s and '70s, the FBI led the Counter Intelligence Program (COINTELPRO), a domestic operation whose purpose was to destroy the New Left, particularly the Black liberation movement but also various communist groups. During that era, the FBI sponsored a group called the Secret Army Organization (SAO), whose leader, Howard Godfrey, was an active FBI informant. The SAO was known for launching attacks against left-wing organizations, ranging all the way from spying to vandalism to beatings and assassination attempts. "The FBI provided funding, they provided weapons and explosives, and they also protected members of the SAO against prosecution," said Matthew Lyons, a longtime anti-fascist researcher and author. "Before that, Nazi and Klan groups hadn't gotten along that well (…) Federal agents and informers played an important role in bringing about that coalition." That era, Lyons said, was the high-water mark for collaboration between American security forces and far-right organizations. It culminated in the Greensboro Massacre, when a coalition called the United Racist Front, comprised of various neo-Nazi and Ku Klux Klan groups, opened fire on a "Death to the Klan" rally organized by the Communist Workers' Party in 1979. "Before that, Nazi and Klan groups hadn't gotten along that well (…) there had been a lot of suspicion between the two," Lyons said. "Federal agents and informers played an important role in bringing about that coalition." Every group in the United Racist Front counted informants and police agents among their membership. Ed Dawson — founder of the North Carolina Knights of the KKK and Greensboro police informant — was given the planned route for the anti-racist march by local police. Bernard Butkovich, an undercover agent for the Bureau of Alcohol, Tobacco, and Firearms, urged members of the neo-Nazi National Socialist Party of America to bring guns and offered to illegally convert semi-automatic weapons to fully automatic. Local police did not assemble at the site of the protest until an hour after the planned start. Shortly before police arrived, the United Racist Front opened fire on the anti-racists, killing five. A police agent was a part of the caravan, but made no effort to stop it. None of the attackers ever served prison time for the day’s events. "It is striking to see the blatant nature of scapegoating leftists while being completely silent about the dangers of right-wing activists, at a time when the right are killing people." Today, many law enforcement agencies regard "Antifa," the moniker assigned to the loose coalition of anti-fascist activists, as a terrorist organization. FBI agents are being taught that "left wing gangs" are the primary national security threat. The Montreal police hate crimes division has publicly stated on multiple occasions that it is investigating anti-fascist activists. Asked whether this marks a significant change, Lyons said that the changes are primarily rhetorical. "It's certainly not new for federal groups to be scapegoating and demonizing leftist activists," he said. "But it is striking to see the blatant nature of scapegoating leftists while being completely silent about the dangers of right-wing activists, at a time when the right are killing people." "There's no question about the disparity in the violence."